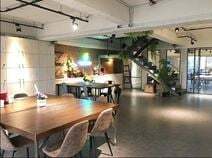 Office Space - Tainan, Tainan City Municipality. A spacious, quirky office space. Private rooms and personal desks are available. Refreshments are on hand to keep you on the go, these include; free coffee and drinking water. An exciting feature of the space is the sizeable exhibition/ conference space. There are lockers, which you can use to store your belongings during your stya. Situated on Chongxue Road. Step outside the building and you will find the nearest bus stop. In the surrounding area there are cafes and restaurants to sample during your stay. A 7/11 is positioned next door to the centre, ideal or a snack or to pick up the essentials before heading home. There is also a medical clinic, ATM and bank located nearby.